Ever since my friend over at Epicurean Vegan introduced my to Kale Chips, I’ve been looking for more ways to make them. I love this recipe by Heidi (her cookbook is really great) and plan to make it again, a lot! Preheat the oven to 350°F / 180°C with two racks in the top third of the oven. In a small bowl or jar, whisk or shake together the olive oil, sesame oil, and shoyu. Put the kale and coconut in a large bowl and toss well with about two-thirds of the olive oil mixture. Spread the kale evenly across two baking sheets. Bake for 12 to 18 minutes, until the coconut is deeply golden brown, tossing once or twice along the way. If the kale mixture on the top baking sheet begins to get too browned, move it to the lower rack. Remove from the oven and transfer the kale mixture to a medium bowl. Taste. If you feel it needs a bit more dressing, add some and toss. 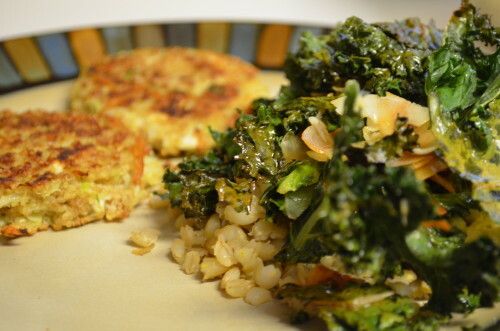 Place the farro on a serving platter and top with the tossed kale. Serve warm. Looks fantastic! This is on my list to try–thanks! You are right, this looks great! I never would have though to combine coconut and sesame! You should check out Heidi’s cookbook, she puts a lot of great tastes together.